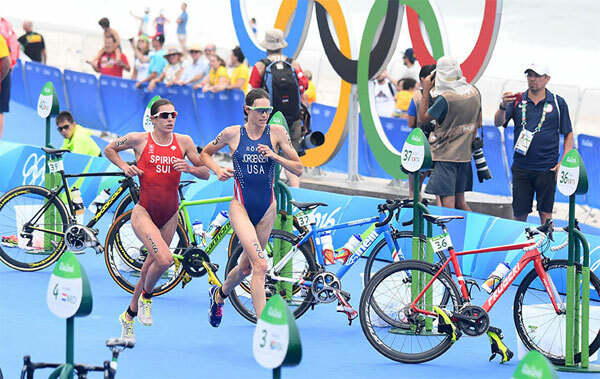 America’s Gwen Jorgensen has cemented her place as one of the best triathletes of her generation, with a strong all-around performance and her killer run kick that delivered her a Gold in the triathlon event at the Rio 2016 Olympic Games. After positioning herself in the lead group from the start of the event, Jorgensen broke away from Switzerland’s Nicola Spirig on the final run lap to claim the win in 1 hour 56 minutes and 16 seconds. Spirig, the London 2012 Olympic Champion, took silver. 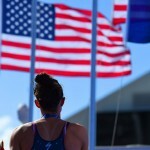 It meant she became the first woman to win multiple Olympic medals in triathlon in doing so. In a thrilling sprint for bronze, Great Britain’s Vicky Holland just edged her teammate, training partner and housemate Non Stanford, to win Great Britain’s first ever medal in the women’s event. The race was indicative of just how far Jorgensen has come since coming into triathlon through a college recruitment program. Jorgensen exited the swim just 11 seconds down from the leaders, right next to Spirig, and then rode strongly in the 18-woman lead group across the technical and hilly course. While she spent almost 8km running side by side with Spirig, she made her move on the final run lap. As seen so frequently on the World Triathlon Series circuit, she then strode away powerfully to record an eventual winning margin of 40 seconds. It was the second biggest winning time in the history of the Olympic event, only behind Emma Snowsill‘s win in Beijing. 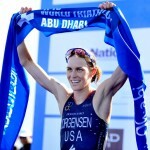 Jorgensen became the first American woman to win a Gold medal in the event, and was also the first winner of a test event to win Gold the next year. Earlier, the day started on Copacabana beach, the first time the Olympic triathlon event has started with a beach sprint into the water. Australia’s Emma Moffatt is no stranger to the sand and used her strength to initially hit the lead in the choppy surf. But at the first buoy the field came together, with Spain’s Carolina Routier leading Brazil’s Pamella Oliveira. Moffatt, Andrea Hewitt (NZL) Katie Zaferes (USA) were just behind, followed closely by Flora Duffy (BER) and Claudia Rivas (MEX). By the end of the 19 minutes in the water Routier had pushed the pace enough to string out the field, but all of the pre-race favourites had stuck right near the top. Exiting the water within 15 seconds of Routier were all those listed above, as well as Non Stanford (GBR), Gwen Jorgensen (USA), Helen Jenkins (GBR), Sarah True (USA), Nicola Spirig (SUI), Vicky Holland (GBR), Erin Densham (AUS), Lisa Norden (SWE), Barbara Riveros (CHI) and Rachel Klamer (NED). The first bike lap saw Non Stanford go out hard in an attempt to split the field, and soon she was joined by Vicky Holland (GBR), Nicola Spirig (SUI) and Flora Duffy (BER) at the front. Taking turns they hammered out the pace, but Jorgensen stuck on the back of the field and by the end of the second lap was ensconced firmly in the lead group. By the second lap the lead group was down to 18, including all four of the Olympic medallists in the field – Spirig, Norden, Densham and Moffatt, reigning world champion Jorgensen, 2013 World Champion Stanford, Commonwealth Games medallist Holland, the in-form Zaferes, Klamer and Riveros, and the always consistent Hewitt. After that second lap a four-woman chase group of True, Oliveira, Sweetland and Amelie Kretz (CAN) were 25 seconds behind. The second chase, led by Laura Lindemann (GER), Cassandre Beaugrand (FRA), four-time Olympian Ainhoa Murua (ESP) and Helen Jenkins (GBR), saw their gap slip out to 54 seconds. By the next lap the gap had extended to almost a minute as the chase groups came together, and they continued to lose ground throughout the 40km leg until the gap between the leaders and the chase was more than three minutes behind the leaders at T2. Back with the lead group on the bike, Spirig and Duffy had attempted to make it interesting by pushing the pace off the front, but at the halfway point of the bike the pack appeared to have settled into a familiar rhythm. But then came another Spirig move, heading back into transition to start the fifth lap the reigning Olympic Champion hit the front solo. However, both her attempts were only short-lived. The second one which she started in the transition area, lasted slightly longer but until the start of the hill, when Duffy moved to close the gap. While Spirig kept up an impressively high pace on the bike across the final few laps, the group appeared to calm as they waited to settle the Olympic race on the 10km run. South Africa’s Marie Rabie had the best transition and hit the run leg first. But she was soon caught by Jorgensen and Spirig, and within the first few hundred metres the pair had hit the front. Jorgensen assumed the lead, with Spirig sitting just off her shoulder. Around 10m behind them came Stanford and Holland running side by side, followed by Moffatt and Riveros. After the first lap Jorgensen and Spirig extended their lead to 16 seconds over the four-woman chase group of Holland, Stanford, Riveros and Moffatt. But halfway through the second lap Moffatt started to fall away, and shortly after so did Riveros. At the 5km mark of the final leg in the Olympic race, it was still Jorgensen and Spirig together in the lead. There was a 23-second gap back to teammates, training partners and housemates Stanford and Holland, and just slightly more to Riveros and Moffatt. “There was some mental games, because I know she is a remarkable runner so I had to try everything to get her off of the rhythm somehow,” Spirig said. While the third lap saw some jostling of position between Jorgensen and Spirig, they hit the start of the final lap together. But it didn’t stay that way for long as Jorgensen pulled out her killer kick, and burst to the lead with around 2km to go. “I have been outrun in races, so it was an exciting race. and Nicola and I were playing a bit of games when neither of us wanted to lead in the head wind, so hopefully it made it exciting for the fans,” Jorgensen said. In the race for bronze, Stanford had initially moved slightly ahead in the final lap but it was Holland who came home with a barnstorming finish down the blue carpet. 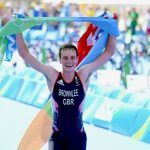 It was Great Britain’s fifth medal in Olympic triathlon, but their first in the women’s event – the other four belong to the Brownlee brothers. 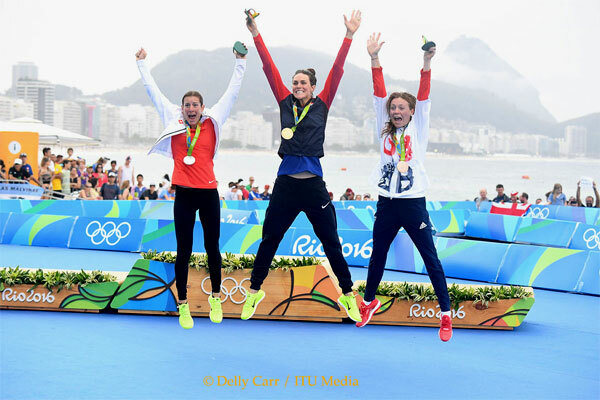 It meant that Great Britain’ claimed three of the six medals on offer in Rio, the first time one National Olympic Committee has claimed that many of the medals on offer. “Starting the run, my legs were a bit tired and it became clear after about five kilometres that I was going to be running with my housemate, my training partner and my best friend for a medal. One of us was going to get one and one of us wasn’t, so that was obviously not what we came here to do, we both wanted medals. But I am delighted that I managed to bring one home,” Stanford said. 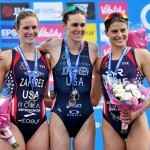 Spirig’s silver medal though was enough to ensure that Switzerland were now level on the overall Olympic triathlon medal tally with Great Britain. After five events, each NOC has two Gold medals, one Silver and two Bronze. Chile’s Barbara Riveros finished fifth and was one of four athletes that posted the first top-10 Olympic finish for their NOC. She also posted the highest finish ever for a South American triathlete at the Olympics. The others included Flora Duffy (BER) in 8th, Claudia Rivas (MEX) in 9th and Rachel Klamer (NED) in 10th. Australia’s triple-Olympian and Beijing bronze medallist Emma Moffatt finished sixth. It was the first time in an Olympic women’s race that Australia did not win a medal. New Zealand’s Andrea Hewitt claimed seventh spot, in a year where she tragically lost fiance and coach Laurent Vidal. Sarah True, who finished fourth in London and fourth in the test event had a heart-breaking end to her Olympic race, she came off the bike and after re-starting her race not once but twice, earning huge cheers from the crowd on the bike course, was forced to withdraw. Ainhoa Murua (ESP), who was competing in her fourth Olympic event, also had to end prematurely. Murua had suffered a stress fracture in her foot ahead of the race, and her day ended early on in the run.